Anyone can have their own TV station - Tecdr Tech Security Blog. Last week I attended the launch of Irish Startupchat which is offering hints and tips for startups as well live interviews via Persiscope. I was also lucky enough to be involved in Irish Startupchats first broadcast and it got me wondering if live streaming gives you the one thing that has eluded the common man and woman until now, the ability to have their own TV station and I think it does. Live streaming allows you and your viewers to decide the content that you wish to stream and also when you wish to stream it. If you decide to do a business show like Irish Startupchat, you will have to choose a time that suits you and your viewers otherwise you won’t get as many viewers. To do live streaming there is only two apps in town, Meerkat and Periscope and they both allow you to promote and share your live stream via Twitter to all your followers, who can also share your live stream to their followers. 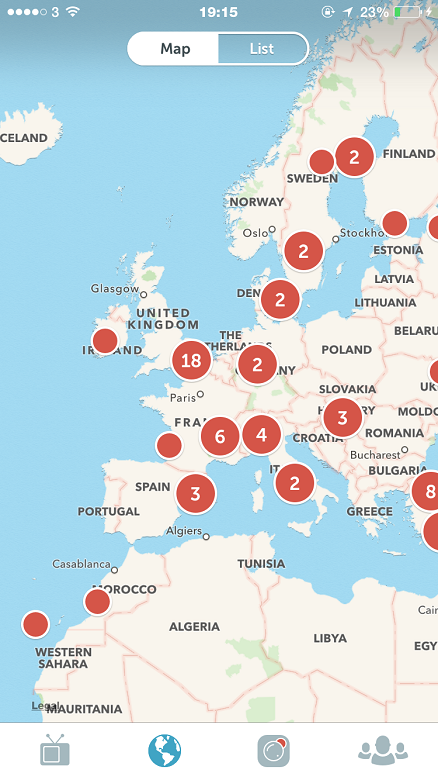 Since Twitter bought Periscope in March this year Meerkat has not had access to everything that Twitter can offer. Now that anyone in theory can broadcast it can become a major headache for parents as Children can in theory view content that is not for their eyes. There are guidelines to be followed for those who are broadcasting and we don’t know how well they are policed. 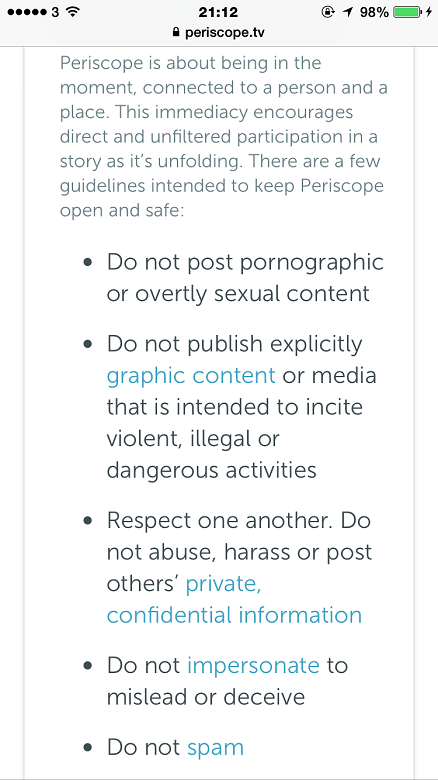 The Periscope guidelines can be seen below. There is also no age limit so in theory a 10 year old could broadcast if they had the equipment. When you are broadcasting anyone can view your broadcasts and also post up comments which you may not want to read. When you broadcast, it automatically also broadcasts your location unless you change your broadcast settings to stop this. Whilst being able to broadcast what you want is a good thing as you have full editorial control and there is also less chance of censorship, you also have to worry about who can view what you broadcast and also some of the comments that will appear. I have seen a few broadcasts where women who are broadcasting have been asked to show parts of their body and they have also been asked questions that were in bad taste. We should be worried about the safety of our children and not should not allow them to broadcast to anyone or to view any broadcasts. Broadcasting from a concert, a sporting event or even a live news broadcast is great but remember for every invention there is also a positive and a negative. People used to say that the internet can be dangerous and can’t be suitable for children. Thankfully there is software that can be used to make sure that the internet can be a safe playground and library for children. We should have the same for live streaming so that our children don’t get corrupted or bullied.